(Nanowerk News) Insatiable demand for popular online applications on the go has created a sustainability time bomb for cloud services, according to Australian research published this week. For the first time, researchers have calculated the energy consumption of the multiple components needed to support cloud services accessed via wireless networks. 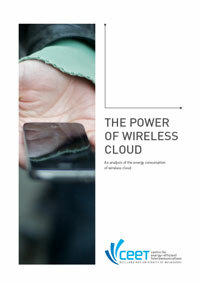 The report "The Power of Wireless Cloud" warns that industry has vastly underestimated energy consumption across the cloud ecosystem as more people access services using portable devices. The popularity of services like Google Apps, Office 365, Amazon Web Services (AWS), Facebook, Zoho cloud office suite, and many others delivered over wireless networks, is driving a massive surge in energy consumption. The energy use of cloud services accessed via wireless networks is expected to grow up to 460% between 2012 and 2015, the equivalent of 4.9 million new cars on the roads. The analysis shows that wireless access networks (WiFi and 4G LTE) will be responsible for 90% of that energy. Data centres, the focus of recent high-profile Greenpeace research, account for only 9%. The new white paper, by Melbourne’s Centre for Energy Efficient Telecommunications (CEET) shows that urgent action is required to curb spiraling energy consumption and CO2 emissions. CEET is investigating ways to improve the way networks are managed for energy efficiency. The global telecommunications system is estimated to consume 2% of the world’s energy, and that figure could grow to 10% by 2020 if no action is taken. “I think its unlikely people trade away the mobile convenience of these services. Another solution might be to increase the way network resources are shared among users, but more likely we’ll need a radical improvement in the efficiency of the technologies themselves and potentially a fundamental change to the way data is managed across the global network. These are the things we’re investigating at CEET.